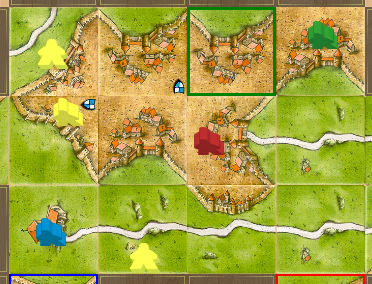 A new city starts to develop in four player game. Red does not know at the moment that he starts something big. Yellow tries to have piece of the cake. Red behaves surprisingly ok, quickly joining two parts of the city. Let's work together! Blue tries to join the group. but is quickly cut out by yellow. Red keeps developing. Just one more tile to go. Green tries to join at the last moment. Green appears to be naughty boy. He tries to steal a city soon after. Some time after Yellow is still putting a fight. 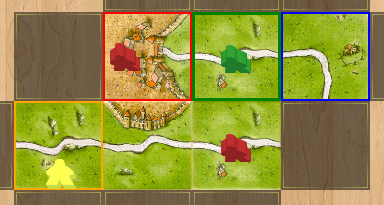 Green manage to join two quarters of the city and yellow joins. City starts to close. 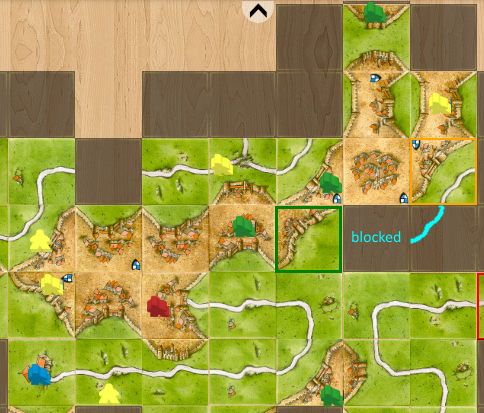 There is big chance to block completing the city by fourth players (eg. if blue road is built). 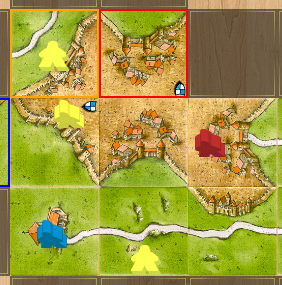 Yellow builds road to protect from blocking. 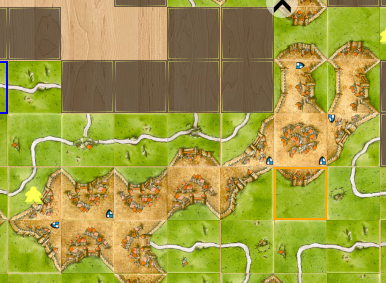 There are only two unfinished edges of the city (both visible below). Since bottom edge is secured. Yellow closes top edge to protect from stealing. Now all that needs to be done is to wait for CFFF tile. 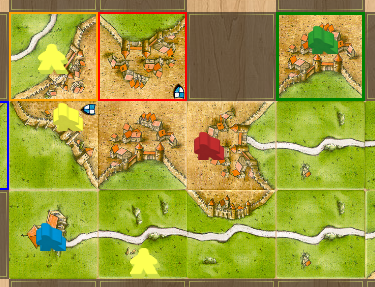 Since both green and yellow needs to close that city, the chances are good. 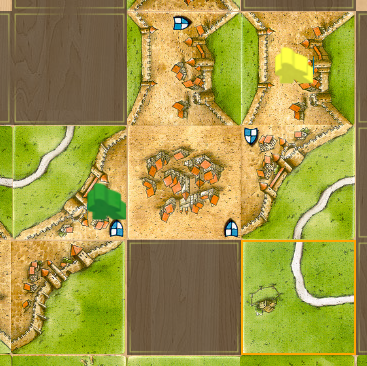 The are only 14 tiles let, but quick counting shows that there is one left in the stack. 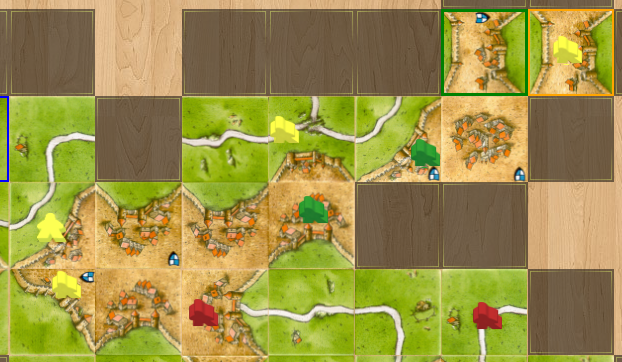 When there are just 7 tiles left yellow draws the missing piece. The City is finished. 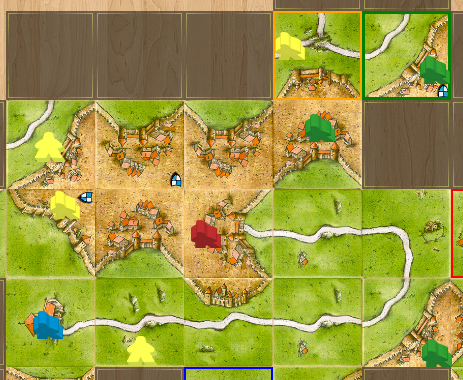 Yellow and green gather 48 points. 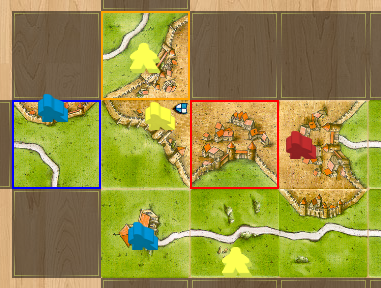 Since yellow won two fields surrounding the city, he gets additional 6 points to the final score.